Badgett Playhouse- This Branson style theatre is a hit among the locals in Grand Rivers, featuring Dinner theatre’s, Fabulous 50s shows, the super 60s and so much more depending on the weekend you are in town. Hiking- go check out some of LBL’s many hiking sites including the infamous hotel California. Boating- Want to rent a boat? Kentucky Dam Marina offers a variety of boat rentals such as pontoon, double decker pontoons, ski boats, and jet ski’s, a perfect way to enjoy the Kentucky Water ways. Fishing- Fish from the bank or hire a fishing guide, both Kentucky and Barkley lake have an abundant supply of bass, blueguill, and catfish. Water-Front Restaurants- Enjoy an afternoon at the Thirsty Turtle at Green Turtle Bay Resort or start your day off with Breakfast at Docker’s Bayside Grill. 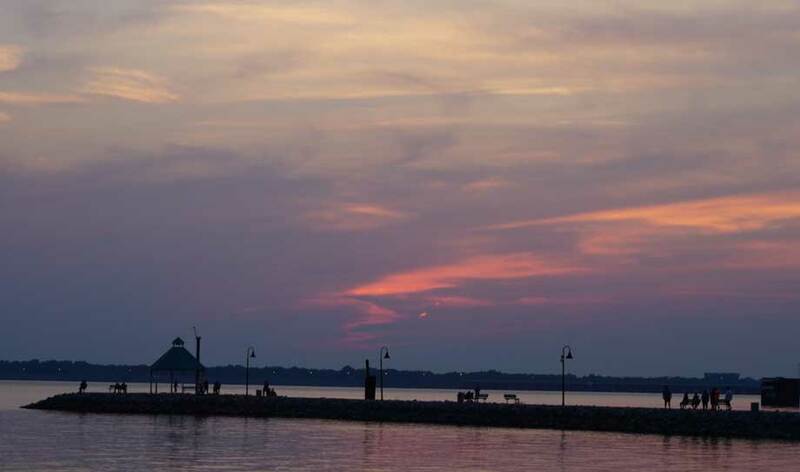 Unforgettable Sunsets- On a clear afternoon around sunset head to Lighthouse Landing, take a walk to the end of the Jetty, and watch the sunset behind the dam. Tyson’s Hometown Market (1.3 Miles) Breakfast, Lunch, Early Dinner: If you are looking for an amazing home cooked breakfast then Tyson’s is a restaurant to check out. They are known for their Southern Charm and biscuits and gravy in this area, and at lunch they serve their famous “Bubba Burger” and Monday – Friday Lunch Specials..
Lite Side Cafe (3.6 Miles) Breakfast & Lunch : Do you love starting your day with Muffins? Lite Side Cafe specializes in low fat muffins and a lighter side of breakfast. With indoor and outdoor seating you have a variety of options to suit your breakfast needs. Cabin Pizza (Picture Above) (3.6 Miles) Lunch & Dinner : Want Pizza delivered to your Campsite, give the Cabin Pizza a call for lunch or dinner. They have an amazing variety of pizza and hot wings (my favorite is the Trace). They have a supreme (The Trace), a Veggie Pizza, and so much more. Docker’s Bayside Grill (7.0 Miles) Breakfast & Lunch: Head back to Docker’s Bayside Grill for your Lunch date as well. Featuring burgers, chicken tenders, and wonderful salads you can enjoy indoor or outdoor seating with sitting Bayside at Green Turtle Bay Resort. Thirsty Turtle (7.0 Miles) Lunch & Dinner : Also nestled in at Green Turtle Bay Resort is the Thristy Turtle Tavern overlooking Double Creek on Barkley Lake. You can even enjoy sitting lakeside on their newly built deck seating. The Thirsty Turtle Tavern also feature live entertainment every weekend! Pizza, grilled cheese, chicken salad stuffed tomato’s, can we just pause for a moment a say YUM!!! 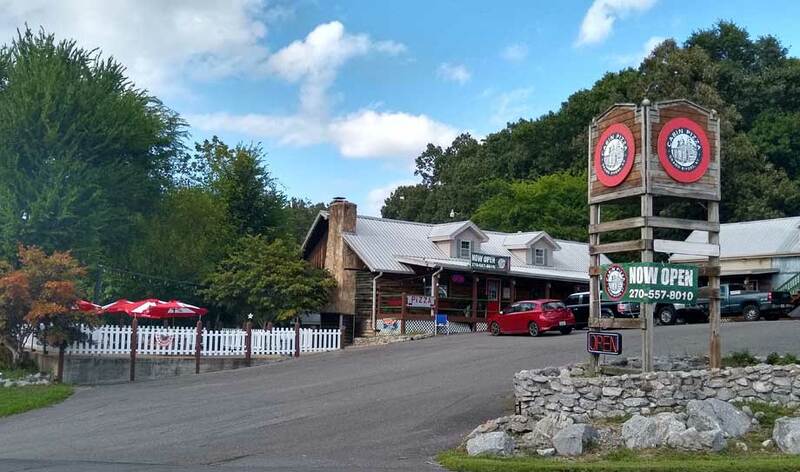 Hamburger Patti’s (3.8 Miles) Lunch & Dinner: Enjoy outdoor seating at the Hamburger Patti’s with the Don’s Chicken Sandwich or their Famous 2 Inch Pork Chop, then if you are still hungry you can stop at their Ice Cream shop and try their one of a kind Ice Cream shop! Knoth’s Bar-B-Que (3.3 Miles) Lunch & Dinner: Knoth’s is known in the area for some of the best Bar-B-Que around and their sauce is amazing. Try a Bar-B-Que Sandwich, Bar-B-Que Plate or a Smoked Chicken.